Dual Spine Weight Forward – Proprietary fusion of different carbon materials that creates 2 spines in 1 arrow to manage energy better and make arrows recover faster, spin 20% sooner, retain more speed and deliver unparalleled broadhead accuracy. BuffTuff® – Front shaft section made with patented BuffTuff, the world̥s toughest and quietest carbon arrow finish. Featuring the exclusive Carbon Express® pattern, and is designed to offer women hunters a higher grain weight for maximum kinetic energy. Real Straightness – Every Mayhem DS Hot Pursuit arrow is laser checked for straightness to a remarkable 1/10,000 of an inch. Mayhem DS Hot Pursuit straightness of +/- 0.0035" is a maximum measurement, not an average. ONE ARROW. TWO SPINES. Twice the ACCURACY. FOR WOMEN. 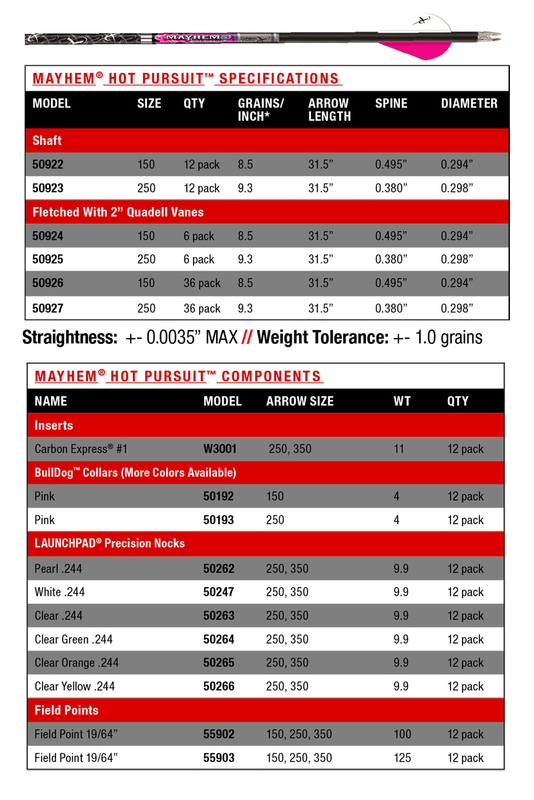 The Mayhem® DS Hot Pursuit® re-defines and elevates hunting arrow performance in the mid-tier price class. The Mayhem DS Hot Pursuit is engineered with our proprietary Dual Spine Weight Forward® technology to deliver more speed, accuracy and penetration. Designed to offer women hunters a higher grain weight for maximum kinetic energy.